In a paper titled, “A Statistical Comparison of Dollar-Cost Averaging and Purely Random Investing Techniques,” which appeared in the Journal of Financial & Strategic Decision Making (1994), Marshall and Baldwin investigated market data to address a much deep seated premise: Does DCA (or Rupee Cost Averaging, in our context) really yield superior investment performance compared to a purely random investment technique?” They found, with a 99% confidence, that there is no statistical difference in the Internal Rates of Return (IRR) achieved by the former technique. In other words, rupee cost averaging (brought about by setting in a Systematic Investment Plan (SIP) ) is not superior to random investing. Note the word ‘random’ here. I had written in my previous post on the subject about how asset management companies make an extra effort to sell the SIP route of entry into the markets (via Mutual Funds). Wealth managers too espouse the benefits of SIP since they must be receiving a larger commission for locking in a nice stream of cash inflow for their suppliers (the asset management companies). Well, this particular study clearly does not make SIPs to be an automatic choice for the financially astute. Like the promotional material from the Benchmark Mutual Fund house, the other paper from Marshall titled, “A Statistical Comparison of Value Averaging vs. Dollar Cost Averaging and Random Investment Techniques” also throws up data tables and charts which indicate that VIP scores above SIP, consistently and always. 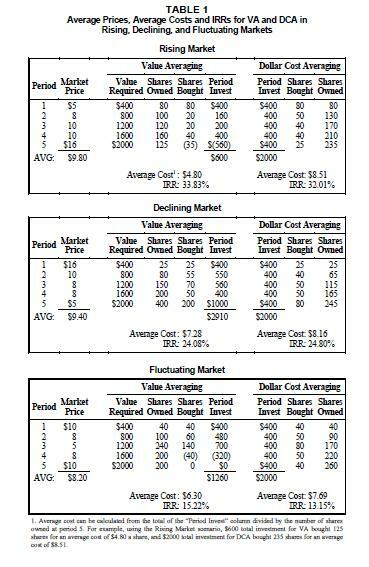 The table alongside (click to enlarge) is from Marshall’s paper on the subject and it shows that the average acquisition cost of shares is always lower in the case of value averaging. Three scenarios were considered for analysis – rising, declining and fluctuating market. VIP is like those arcade video games which are now distributed as freeware where in one instance you’re flying a helicopter through a rather long undulating tunnel with assorted obstacles in the path. If the chopper is rising, ease up on the throttle else it’ll crash into the roof of the tunnel. If it’s falling then press the throttle well lest it crash to the floor of the tunnel. So, while this analogy is weak, it perhaps visually brings out the problem that I see with value averaging. I guess it forces one to operate in a range. 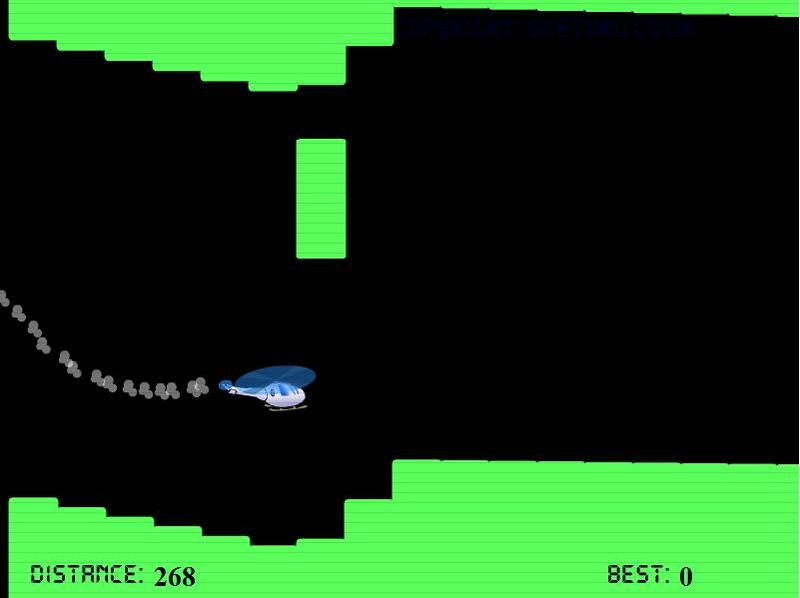 In the arcade game, the chances of your chopper travelling the farthest and therefore reaching the end of a particular level is highest if one manoeuvres it successfully through multiple escalating and de-escalating sinusoidal paths. Similarly, the returns from value averaging come in best when you let the scheme run through at least a couple of up and down market cycles. If the market rises for a good long period in an upward channel then this technique will definitely trump the plain jane SIP option. However, if the investment horizon is smaller – say 1 – 2 years and the market keeps continuously rising, I am not sure if a VIP will give the best returns (as compared to a buy and hold). The other point is the fairly active monitoring that needs to be done. It clearly is not an option for the masses and even for the nerds who fancy taking this on, this may lead to deliverance. The jury may be out regarding my nerd status but my thinking in this is that if I have to benefit from a systematic investing method which guarantees a low cost of acquisition and requires fairly active monitoring – is there something that I can improvise and build from the scratch. Never mind if countless other nerds may have hit upon the method themselves and written and practised it. That is something I want to develop and write about in my concluding post on VIP. My main aversion to the VIP plans as they now stand in India is that I might have to do a fair amount of running around with banks, fund houses, payment instructions etc. Given the prospect of an escalating workload and a need to find a good long term occupation for my funds I need something which might be equally (if not more) high touch to evaluate but low touch to execute. I have an idea forming – should come out soon.